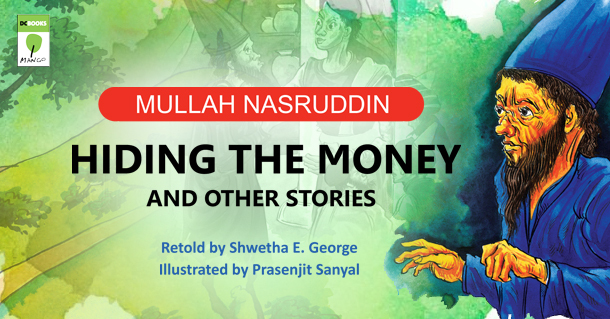 Hiding the Money and other stories is a collection of Mullah Nasruddin stories retold by Shwetha E George. In these stories, Nasruddin is faced with a problem and to solve them comes up with absurd and nonsensical solutions, some of them to his own cost. HIDING THE MONEY sees him tackle the problem of hiding a bag of money – only to end up with camel dung. In BEGGARS, a couple of cunning riff-raffs try to wheedle Nasruddin out if his money. One of them receives his benevolence while the other, the hard-to-digest logic of Mullah Nasruddin. He outwits his friends, who had forced him into a bet where he had to stand outside on a cold winter’s night, in THE CANDLE DOES NOT GIVE ANY HEAT. The incorrigible Nasruddin renders a renowed scholar speechless in THE WISE OLD MAN and in WORSHIPPING A NAIL, finally finds a way to deal with a cunning neighbour.